Summer volume of the Breviary of Renaud; Marguerite de Bar, Metz ca. 1302-1305 Verdun, Bibliothèque municipale, ms. 107, fol. 99v. This month’s reading will be the comic fifteenth-century King and Commoner bourde John the Reeve, taken from Ten Bourdes, ed. Melissa Furrow (Kalamazoo: Medieval Institute Publications, 2013), and/or Bishop Percy’s Folio Manuscript: Ballads and Romances, Vol. II, eds. John W. Hales & Frederick J. Furnivall (London: N. Trübner, 1868). The sole copy of John the Reeve is preserved in Thomas Percy’s folio manuscript (British Library Add MS 27879). A date for John the Reeve’s composition can be deduced from the tale’s statement that there had been ‘kings three’ named Edward, thereby placing its composition between the death of Edward III in 1377 and the accession of Edward IV in 1461. The surviving version was likely composed around Lancashire, but was also clearly well known in Scotland. There are references to it in Gavin Douglas’ The Palis of Honoure (c. 1500), William Dunbar’s complaint To the King (‘Exces of thocht dois me mischeif’) (c. 1500), David Lyndsay’s The Testament and Complaynt of Oure Soverane Lordis Papyngo (1530), and Harleian MS. 207 (1532) – the latter of which sees John intercede in an argument over transubstantiation between Piers Plowman and the Lutheran ‘Iacke Iolie’, demanding that they set aside their differences and instead eat the food. The medieval King and Commoner genre has had a deep influence on British literary culture, including shaping the Robin Hood tradition and inspiring scenes in several of Shakespeare’s plays. However, this material has rarely been studied. The fifteenth-century King and Commoner bourdes generally depict a king becoming lost in the forest and encountering a disgruntled, rustic commoner, from whom he conceals his royal identity. The commoner provides various political complaints regarding the court, before inviting the incognito king back to his home and presenting him with a feast of poached deer. The end of these tales sees the commoner invited back to court under some pretence, where the king reveals his true identity amid a second royal feast. Despite fearing execution, the commoner is instead usually granted a lavish reward and a position in the court. The kings of these medieval tales are often complex figures who restore social balance, but can at the same time be interpreted as somewhat unsettling spies. Yet the most fleshed-out characters are almost invariably the commoners, with the main action taking place in their liminal, inverted worlds. Unlike the forests of romance, or the beautiful, fantasy greenwood of the outlaw narratives, the distinctly chilly forest worlds of the King and Commoner material present the commoners’ realistic hardships, tragedies and struggles. John the Reeve is one of the oldest of these tales, surviving from around the middle of the fifteenth century. It features many details unique to the King and Commoner genre, including companions for both the king and the commoner, a relatively high ranking commoner living in a more urban setting, a chaotic dance, and John’s bloody storming of the court. John the Reeve has been dismissed as a simplistic, conservative ‘portrayal of a churl blundering his way amongst royalty’. Is this a fair assessment? Or can this tale be perhaps interpreted as a more complex, or even radical text? For instance, how does this tale relate to the social upheavals and peasant revolts of the late fourteenth and mid fifteenth centuries? The medieval King and Commoner tales revolve around two feasts, one in the commoner’s house and one in the court. How are they portrayed in this text? What are their similarities and differences? Who is in charge? To what extent can this feasting be viewed in relation to the mock fool-kings who presided over feasts in the medieval carnival festivities, or Bakhtin’s conception of the carnivalesque? Where does the text fit into medieval genre? How does it relate to medieval romance (e.g. the ‘menacing tester’ of the Gawain romances), or the early Robin Hood material? It refers to itself as a ‘bourde’ (a jest, deception, or trick). How accurate is this term in describing the tale? There is a repeated focus on triumvirates throughout this tale. What is the effect of this? 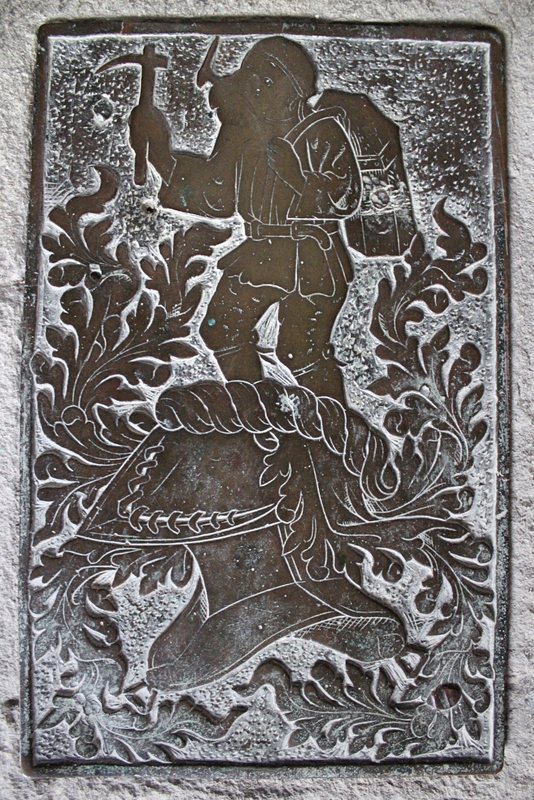 The Forest of Dean ‘Freeminer brass’ (c. C15th-C17th), from ‘The Cathedral of the Forest’, All Saints Church, Newland. Photographed by Mark Truesdale. S. H. A. Shepherd, ‘”Of thy glitter and gyde have I na gle”: The Taill of Rauf Coilȝear’, Archiv für das Studium der neuern Sprachen und Literaturen, 228 (1991), 284-98 (p. 297). Mark Truesdale is completing his PhD thesis at Cardiff University on the carnivalesque politics of the fifteenth-century King and Commoner material.